Description: I will donate a signed copy of three of my latest books. 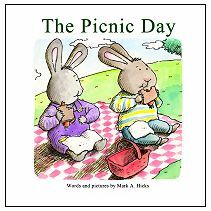 The Picnic Day, Elwood’s Plans, and the Grand Adventure. These books can be viewed at http://www.Pumpkinsproutbooks.com and http://www.BookLanding.com. Bio: I’m an award-winning whimsical illustrator creating artwork on assignment and independently for numerous publishers and companies around the globe. Creating fun and inspiring stories and illustrations for children, teens, and adults is my goal and passion. My experience includes illustrating children’s books and magazines, textbooks, greeting cards, educational clip art, websites, advertisements, marketing materials, POP displays and signs and much more. WINNER: Tara wins with a bid of $30! Congratulations on your winning bid. I will be in touch later today with instructions for making and verifying the UNICEF donation.